View of Temple of Theseus from South East. Digital image of AB/1960. 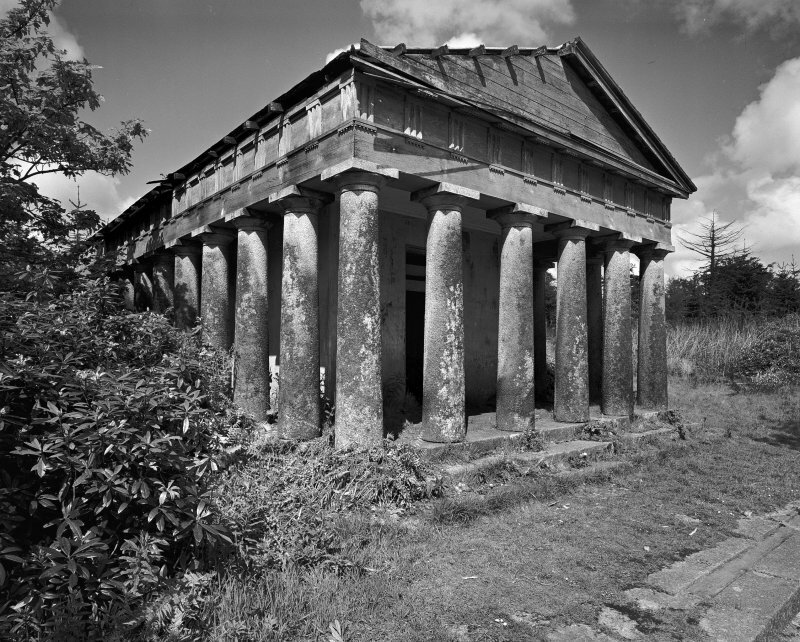 (Ornamental) Temple of Theseus, built in ground of Pitfour House (NJ94NE 67.00) beside the lake. Temple and designed landscape. Air photograph: AAS/97/13/CT. Small Greek Docic Hexastyle temple with 34 granite- column peristyle; wood entabuature; very finely detailed. Interior contains cold bath. Roof dilapidated and parts of cornice missing. Wilson Smith credits the building of the temple James Ferguson 'the member' c. 1809-20; but the N.S.A. v. 12 p 141 describes it as 'lately erected'. Although the house was demolished in 1927-30 and the grounds have suffered much from timber felling, the Lake and its surrounding buildings still have great landscape and architectural value.